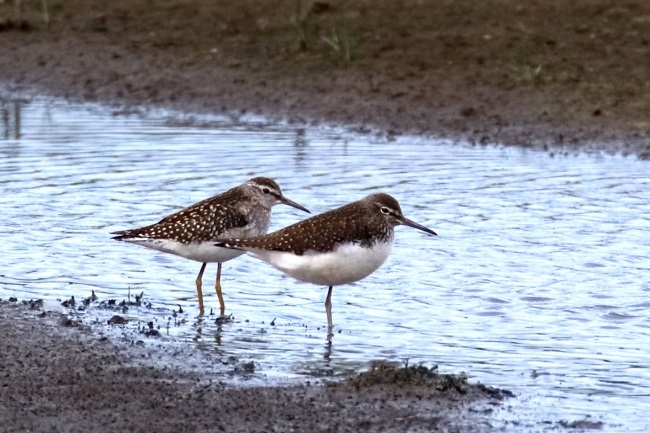 Have Arctic-breeding Waders had a poor breeding season? 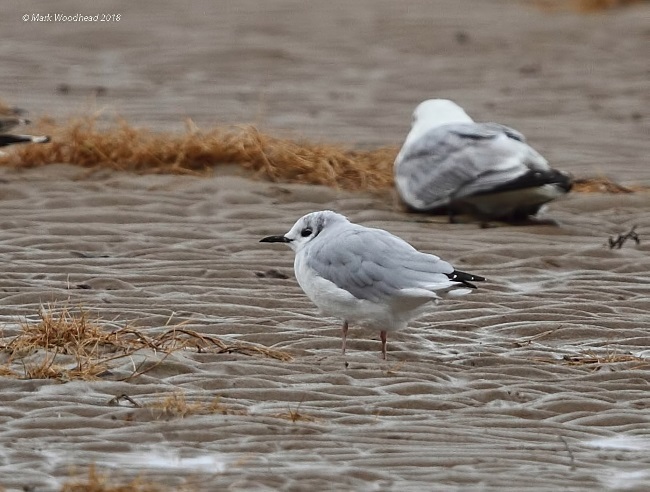 I was just looking through the gulls to see if there was anything different in there or any birds with colour rings when I saw what I thought was a Little Gull; so I called Allan Conlin as it was a matter of yards from his house. Allan came over but the bird had decided to squat down and tuck its head away and sleep by this point. When it finally stood up Allan, with some shock, said "it’s a Bonaparte's!!". I am not familiar with rare gulls so I was equally shocked. The bird then flew away and showed us its wing pattern. In all fairness all I did was find a different looking bird in the roost and Allan was really the one who identified it so should really take the credit. It’s all a learning curve for me as I’ve only been birding seriously for about six years now so a lot of these birds are things that I’ve only read about in books. Tim Kinch. 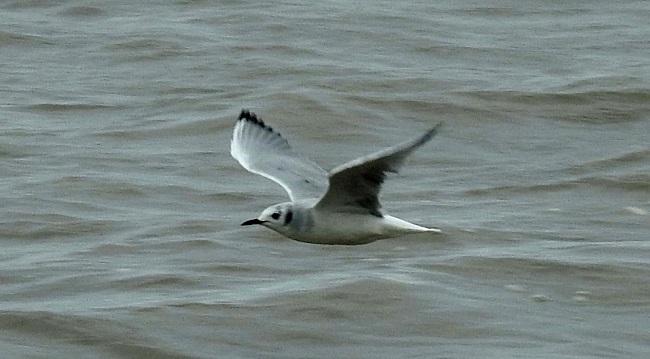 The Bonaparte's Gull was first spotted on August 12th and was last seen on the 29th, for the first few days it was recorded on Hoylake Shore during the spring tides, but it was then seen from Hilbre on the 17th feeding east of the island and it's pattern of movement then seemed to be feeding at low tide off Hilbre and on the tideline on East Hoyle Bank for a couple of days, but on the neap tides from the 19th onwards it was only recorded at Hilbre, usually early morning. 1990 New Brighton on April 22nd, 24th and 29th. 1991 New Brighton from March 20th to April 20th. 1994 Inner Marsh Farm RSPB from June 1st to 14th. 2004 Inner Marsh Farm RSPB on May 20th. The 1990 bird was one of two also seen at Seaforth Nature Reserve across the River Mersey, and it is probable that the 1991 bird was one of these returning. 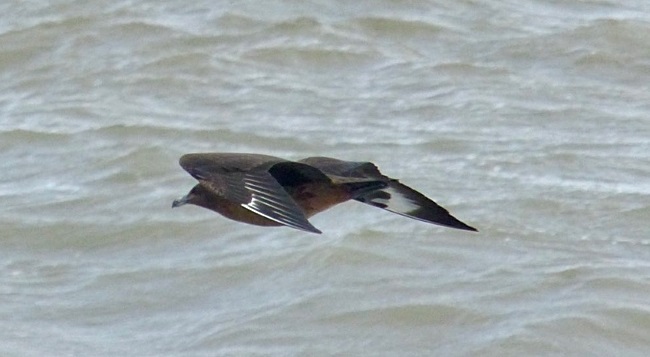 The only record on the Welsh side of the estuary was in 1994 with the bird being seen on both sides of the border. The only other Cheshire record was one at Richmond Bank (Mersey Estuary) in 1998; along the North Wales coast there have been seven records, mostly in Anglesey, including a bird which returned there three years running. Nationally, the Bonaparte's Gull is a BBRC (British Birds Rarity Committee) rarity and typically we get around seven records a year (there were 10 in 2015 and five in 2016), the current trend is that records are increasing in the UK. As can be seen above many birds return to the same sites in following years. There doesn't appear to be any pattern to the national records with birds scattered both across the country and seen throughout the year, this is consistent with long-staying birds. Bonaparte's Gull is not named after Napoleon Bonaparte but after his nephew Charles Lucien Bonaparte, a French ornithologist. This species is the third smallest gull in the world, with only Little Gull and Saunder's Gull being smaller. Apart from it's size the most remarkable thing about it is that it is the only gull to breed regularly in trees. 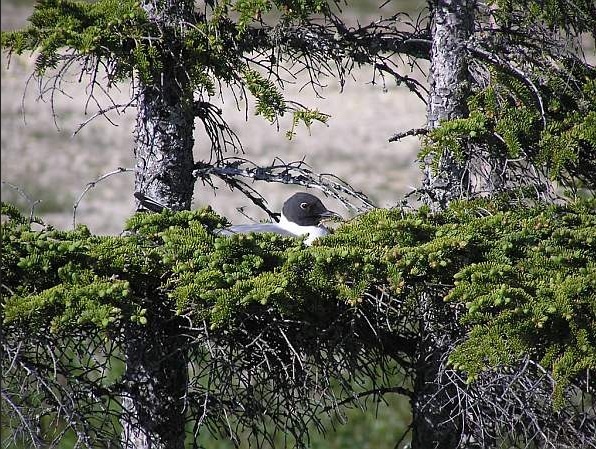 Their nests are difficult to see as they breed in small scattered colonies in remote forests right across Canada and Alaska, they winter on both coasts of North America sometimes in huge flocks up to 100,000 strong. Their occurrences in Europe may be linked to strong south-east movements across Canada in autumn. Most sources describe the population as either stable or increasing. 1. Pers. Comm. - Tim Kinch and Allan Conlin. 2. deeestuary.co.uk records published in Latest Sightings page during August 2018, thanks to everyone who contributed. 3. 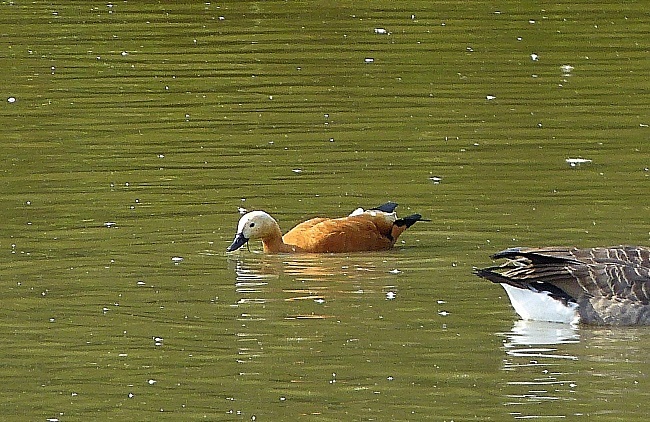 Allan Conlin and Eddie Williams, Rare and Scarce Birds of Cheshire & Wirral, 2017 (see http://www.deeestuary.co.uk/news1117.htm). 4. Robin Sandham, Scarce and Rare Birds in North Wales, 2017 (email: robinsandham@hotmail.co.uk). 5. Waterbird Population Estimates, Fifth Edition, Wetlands International 2012. 6. Birds of the Western Palearctic - on-line edition (2006). Recent reports that NE Greenland was blanketed in snow in the breeding season suggested that 2018 might be a wipe out for Arctic-breeding waders, and this coming after very poor breeding productivity for Red Knot (Calidris canutus islandica) in 2017. The juveniles aren’t due to arrive in the UK just yet, but there may be a glimmer of hope from analysing the biometrics of colour-ringed adults resighted just after they returned from the north. 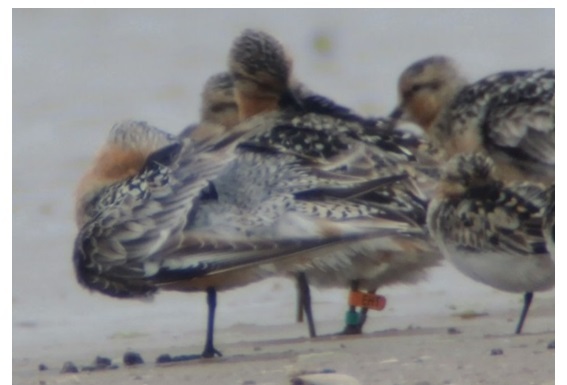 On 22nd September 2017 and 30th March 2018 a team including many members of South West Lancs, North Lancs and SCAN Ringing Groups fitted about 1,000 Red Knot with coded orange flags at Altcar Training Camp near Formby, Merseyside, and recorded their wing and bill lengths. Since the middle of July we have been observing their return to the beaches around the ringing site. Arrival started on 15th July and numbers grew over the next weeks. By reading the flag codes we could identify which individuals had returned. 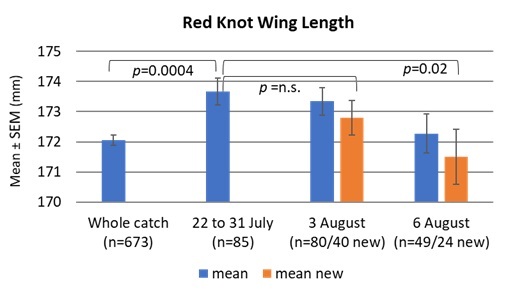 Looking at the biometrics of the Red Knot that we read between 22nd and 31st July we were intrigued to see that on average they had statistically longer wing and bill than the whole catch population (see graph below). Furthermore, flagged Red Knot that were newly observed on 3rd and 6th August had an average smaller wing and bill than these early arrivals. Since female Red Knot are on average larger than males this is an indication of the females arriving back before the males. 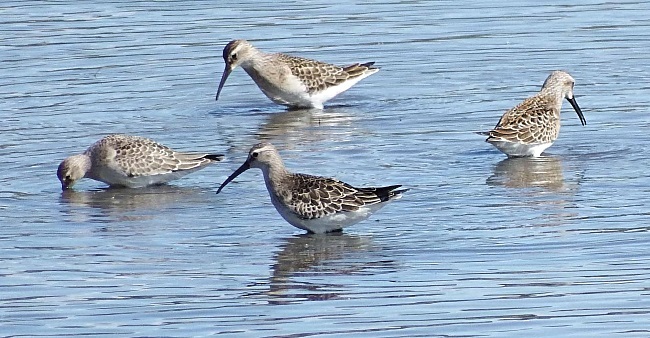 As female Knot leave the breeding grounds shortly after the eggs hatch whereas the males remain until the chicks fledge this, in turn, is an indication of probable breeding success. Time will tell, but maybe our readings of flagged Red Knot offer hope that although NE Greenland had nil productivity, there has been success elsewhere in islandica Red Knot’s breeding range, which extends across Arctic Canada. Red Knot Of-EHT digiscoped at Formby Point on 22nd July 2018, having recently returned from the Arctic. Wing length when flagged was 178mm - well above the catch average (see graph), so most likely a female. If you are unsure who to contact then email Jim Wilson (jimwils@online.no), who is the European Colour-ringed wader coordinator, or Richard Smith ( ). 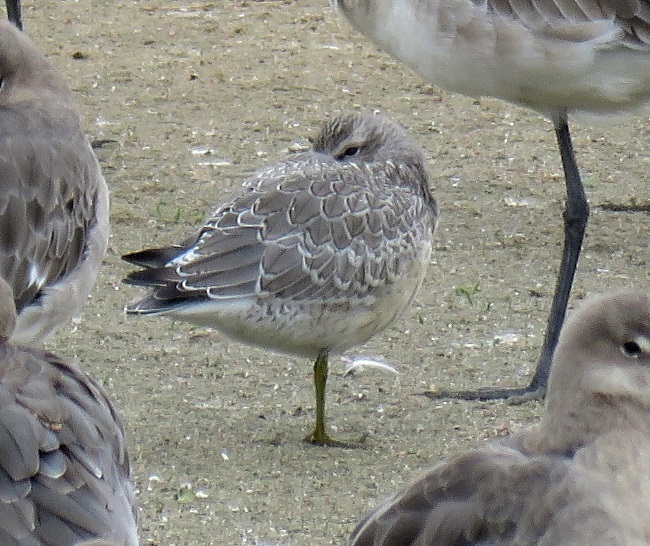 Rose and Peter wrote the above in the first week of August, since then juvenile Knots have started arriving and are being seen on the Dee estuary, North Wirral, Crosby and Southport. From my own limited number of observations it would appear that they have had a good breeding season with 11 juvs in a flock of 68 at Crosby on August 20th, eight Knot at Caldy, six of which were juvs on the 25th with ten juveniles there on the 31st, and eight Knot, all juveniles, at Hoylake on the 28th. So the answer to the question at the head of this article appears to be 'No', at least for Knot, which is very good news. August is usually a good month for spotting colour-ringed birds and this year was no exception with various waders, gulls and terns recorded. Below is a summary with many thanks to all who contributed. Y//G-L//G Ringed in southern Iceland on 20th June 2018, as a breeding adult. Recorded on Hilbre on 1st and 3rd August 2018. 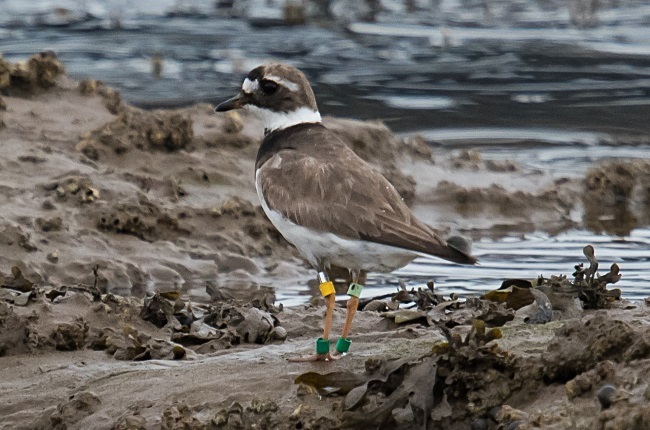 This is only the second colour-ringed Ringed Plover in our Dee Estuary data base. O-Y(92P) - Orange ring on left tibia, Yellow ring on right tibia engraved with 92P. Ringed at Ynyslas NNR, near Aberystwyth, Wales, on 16th August 2018, as a juvenile. Recorded on Hoylake Shore on 28th August 2018. We also saw a juvenile Dunlin in 2017 which had been ringed at Ynyslas, so both showed an interesting northwards movement after ringing. 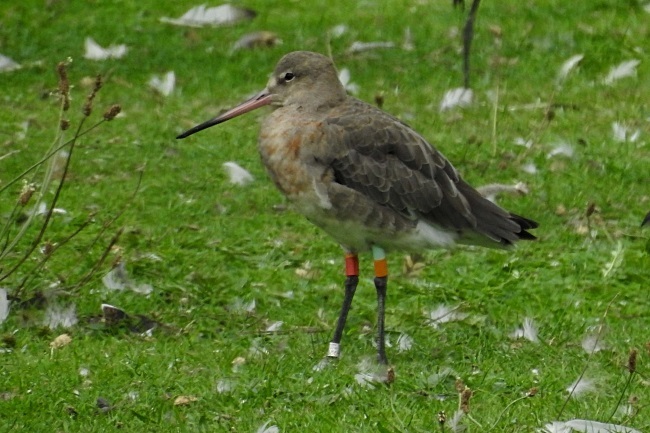 We recorded 20 different colour-ringed Black-tailed Godwits through August, actually quite a poor return considering the very large numbers of godwits present at Caldy. Currently none are ringed in the North-west of England but we are hoping to rectify that at some stage. Below is a nice photo of one of them and you can see it is moulting with loose feathers on the bird, with plenty more scattered on the ground. LO-OR - Ringed in northern Iceland in July 2004, as a chick. Since returning from Iceland in 2018 it has been recorded on 2nd July at Nene Washes and on 3rd August at Seaforth NR since when it was at Caldy from 17th August to the month-end. 2nd July is a very early returning date and interestingly it's only other record on the Dee estuary, at Thurstaston, was also early on 4th July 2017. Does this mean it has had two failed breeding seasons on the run? In 2013 it was in northern Iceland on July 7th, a more usual location for a breeding adult on that date. This bird spent the winter of 2005/06 in southern Ireland before turning up in the Netherlands in April 2006, and again there in March 2008. Since then most records have been from Marshside RSPB (Southport) although it does usually go missing for several months in winter. ABT - orange letters on blue ring. 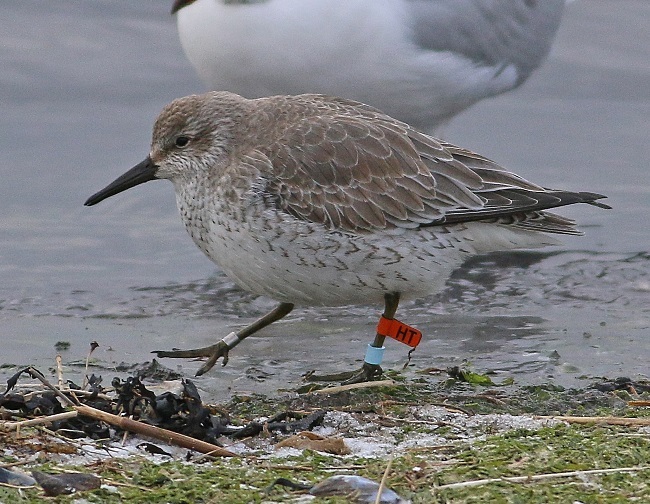 Ringed at Gloucester landfill site, Gloucester, on 11th November 2006, as a juvenile. Recorded on Hoylake shore on 10th August 2018. Although the ringing site is distinctly unglamorous since then it has had some interesting movements. March and then December 2007 saw it in northern Spain. In 2010 it was on the Atlantic coast of France, also in March and December. It was in Somerset in February 2012, it then went missing before being recorded in France again in early 2017. The last place it was recorded before turning up at Hoylake was in another landfill site, this one in Wiltshire, in December 2017. There are no breeding season records but it's presence at Hoylake in August suggests it may breed north of here, or perhaps over in Ireland. AKEL - white letters on green ring (left tarsus). 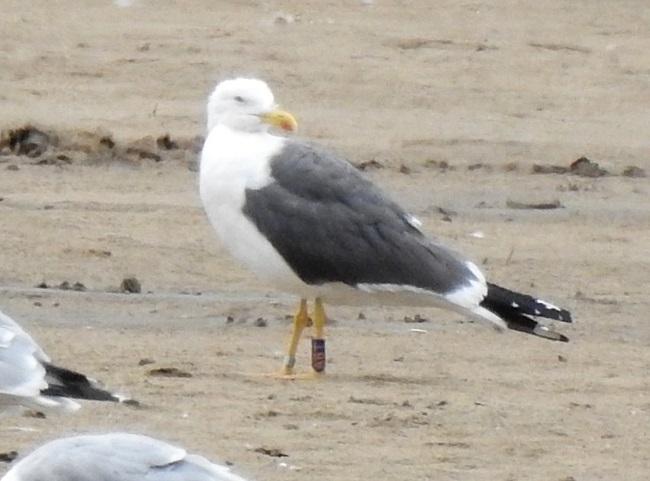 Ringed on Pionierinsel island, Elbe estuary, Germany on 20th May 2015, as an adult male. Recorded on Thurstaston Shore on 26th to 30th July 2018. It was recorded back at it's ringing site in May 2015. PYY1 - white letters on red ring. Ringed in north-east Poland on 18th May 2017 as an adult female. Recorded on Thurstaston Shore on 8th August 2018. The only other record was back at it's ringing site in May 2018. TVTL - black letters on white ring. Ringed in Poland on 8th June 2017 as an adult male. AF929 - black letters on white ring. Ringed in Helgoland, Germany, on 19th June 2015. Recorded on Hoylake Shore on 10th August 2018, no other records. Richard Smith. Colour-rings were also recorded by Tim Kinch, Steve Hinde, Matt Thomas, Graham Jones, Tate Lloyd, Les Hall and Elliot Montieth. 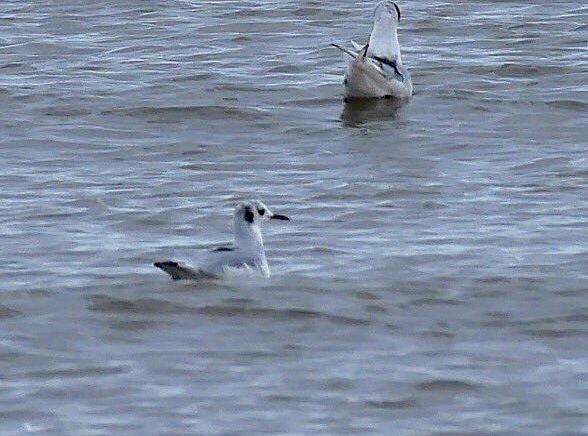 The bird of the month was undoubtedly the Bonaparte's Gull which is covered in the above article, closely followed by the reappearance of the Spotted Crake seen on the main scrape at Burton Mere Wetlands on several days around the middle of the month. Several days of windy weather brought same great sea-watching including 35 Arctic Skuas and four Great Skuas from Hilbre on the 24th, two Grey Phalaropes were recorded on the same day and on the 27th there was a brief glimpse of a juvenile Long-tailed Skua at Hoylake. There were seven four-figure counts of Sandwich Terns through the month although the number of Common Terns recorded was low. At Gronant Little Tern colony it was another record breaking season, despite Storm Hector, with 174 pairs (a record) producing 192 fledglings (third highest). Gronant seems to be so productive at the moment that it seems to be drawing in birds from other, smaller, colonies. The sight of up to 6,000 Black-tailed Godwits in one small field next to the busy A540 at Caldy seems almost bizarre when you think that's almost 10% of the entire Icelandic (Islandica) population. A count of 175 juveniles means they had a reasonably good breeding season although not as good as last year's exceptional season. It is certainly a spectacular sight watching them flying in from the estuary before high tide. 30 Greenshank at Parkgate was a good count, scarcer waders included a Wood Sandpiper at Burton Mere Wetlands early in the month and a couple of records of adult Curlew Sandpipers, but no juveniles yet. So far the passage of small waders has been fairly small, and we await the return of the main body of Knots with some anticipation hoping we will see plenty of ringed ones. Other notable records included a long staying Cattle Egret, four Spoonbills and a Ruddy Shelduck - all at Burton Mere Wetlands. Many thanks go to Jeremy Bradshaw, Mark Woodhead, Charles Farnell, David Haigh, Steve Hinde, Matt Thomas, Chris Butterworth, David Leeming, Alan Hitchmough, Steve Williams, Derek Bates, Allan Conlin, Karen Leeming, Frank Burns, David Thompson, Henry Cook, Graham Jones, Richard Beckett, David Small, Hugh Stewart, Steve Round, Tim Kinch, Elliot Montieth, Tate Lloyd. Les Hall, David Poole, Roy Lowry, Mal Seargant, Patricia Bargh, Bill and Gild Keig, Paul Mason, David Wilson, George Knight, Colin Schofield, Alan Irving, Mark Garner, Steve Hart, Ronan Duffy, Dave Harrington, Pam and Bill Aitken, Bill Owens, Leon Castell, Mike Coupe, John Dawson, John Francis, Ian Goldstraw, the Lighthouse and Wirral Birding Blog, the Dee Estuary Wardens and the Hilbre Bird Observatory for their sightings during August. All sightings are gratefully received. Just how good September is very much depends on the weather as it's all about sea-watching. To get a really good passage of Leach's Petrel (and we could be talking about hundreds) we need a prolonged north-westerly gale lasting several days, and the nearer it is to the middle of the month the better it will be. North Wirral, Hilbre and Point of Ayr are the best places in the country to see these birds, the best viewing spots are New Brighton (both by Fort Perch and at the end of Harrison Drive), Leasowe Gunsite car park where you can watch them whilst sheltering in your car, Hoylake/Meols Promenade, Red Rocks, Hilbre and Point of Ayr. With the Leach's should be Long-tailed, Pomarine, Great and Arctic Skuas, Sabine's Gulls and Grey Phalaropes plus Gannets, auks etc. Those who are lucky enough to experience a classic September day here will remember it for the rest of their lives! But some Septembers can be flat calm. No need to despair, though, as there will still be plenty to see including Curlew Sandpipers, Greenshanks, Ruffs and Little Stints whilst out to sea we often get thousands of Common Scoters offshore always easier to see on a still day. The list of rarities for September is impressive and include Hoopoe, Red-backed Shrike, Red-necked Phalarope, Semi-palmated Sandpiper and Western Sandpiper whilst there is always the possibility of a Sooty or Balearic Shearwater. 10th September, 12.20hrs (BST), 9.8m. 11th September, 13.03hrs (BST), 9.9m. 12th September, 13.43hrs (BST), 9.7m. Saturday 15th September - Hilbre Low Tide Birdwatch. Join the Coastal Rangers and the RSPB on this low tide walk across the sands to Hilbre Island to look for the special birds that return here for the winter months, and others that use it as a vital rest stop on their autumn migration. Suitable clothing, stout footwear or wellingtons are recommended. Bring binoculars if you have them. The walk lasts approximately 3.5-4 hours and covers around 4 miles across fairly soft, flat ground and some seaweed covered rocks. Composting toilets are available on the island. Places are limited and there is a charge of £7 per person which will be shared between the RSPB and Friends of Hilbre. Meet by noticeboard at West Kirby Sailing School car park at the north end of the marine lake. Advance notice of this annual event - see http://wirralwaderfestival.blogspot.com/p/2018.html for more details. There will be high tide roost watching events at both Hoylake and Red Rocks/West Kirby. There will also be an indoor event at the Hoylake Sailing Club on Hoylake seafront, where stalls and children's activities can be found.